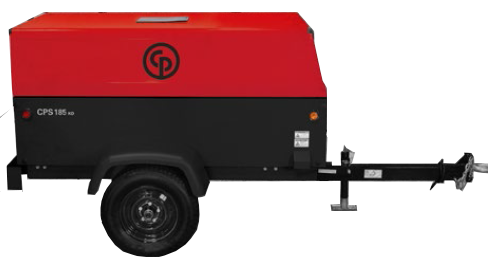 The CPS 185 KD T4F portable air compressor from Chicago Pneumatic offers many features asked for by the rental industry. The corrosion resistant galvanneal steel canopy will ensure many years of service. A compact, light weight design provides greater maneuverability and added safety while towing. The CPS 185 KD features a highly efficient, direct-drive air end that provides 185 cfm of compressed air while using only a 49 hp engine. The control panel and discharge valves are conveniently located at the rear of the compressor. Discharge Valves 2 x 3⁄4"